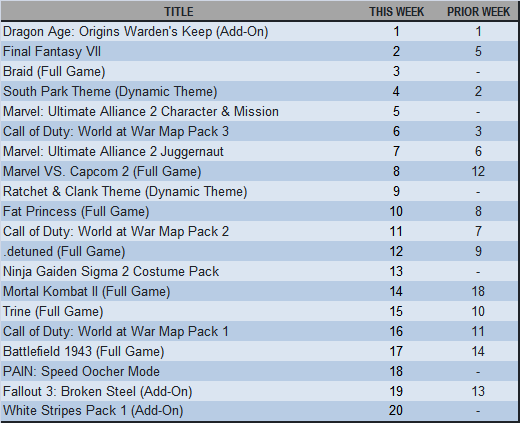 Below is a list of the top downloaded items from the PlayStation Store for the week ending November 19th. The list sees the Warden’s Keep DLC for Dragon Age: Origins retain the top spot, while newcomer Braid takes the number 3 spot. The biggest jump up in the rankings came with Marvel vs. Capcom taking the jump from 12th to 8th. Call of Duty is still showing strong with plenty of content in the top 20. The full list is below so check it out.